As product designers, we aspire to build product experiences that are not only useful (solve a real pain point for our users) and usable (effortlessly allow our users to accomplish their goal), but ultimately delightful (elicit a positive emotion from users). I find product teams are usually pretty good at building useful experiences, identifying pain points through market research, industry expertise, and their own experiences. Similarly we've established a strong set of best practices around building usable experiences, through significant design methodologies and established guidelines. Yet the dimension we continue to struggle with as an industry is repeatably building delightful experiences. The challenge with designing a delightful experience is inherent in the very nature of needing to elicit such an emotion from our users. It requires us to get into our user's head enough to deeply understand what in fact will create such an emotional response. To build this muscle, I've found it incredibly helpful to invest in learning about human psychology. And specifically there have been a few frameworks that I've found particularly insightful and applicable to understanding user psychology. In this series of posts, I will share my favorite user psychology frameworks that will help you design more delightful product experiences. Today I wanted to introduce you to your happy chemicals, an incredible framework for understanding happiness, popularized by Loretta Graziano Breuning, an author and professor at California State University, East Bay. The science of happiness tells us that happiness, like most of our emotions, is simply the result of releasing happiness-related chemicals into your brain. And specifically, four chemicals are potentially at play when you feel happy: dopamine, serotonin, oxytocin, and endorphin. Each of these chemicals is released in response to different emotional states. As product designers seeking to deliver happiness to our users, what better way to understand how to do that than specifically understanding when these four chemicals are released into our brain. So let's talk about each of these chemicals in turn. Dopamine is released in the brain when we expect a reward. It's that exciting feeling we get when we are about to be rewarded. For example, when you achieve a long-sought goal. Or even when you simply take a step toward a goal. It's also released when you see another person take a step toward a goal. Ultimately it's all about taking a step toward a goal and expecting to be rewarded for it. Learning to ride a bike, playing an instrument, finishing a crossword puzzle, and getting a promotion all release dopamine in our brain. 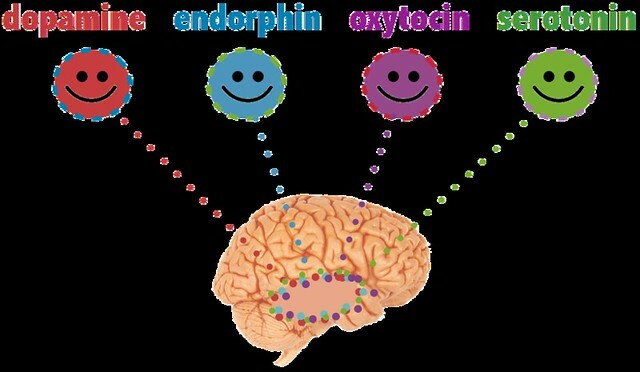 Serotonin flows in the brain when we feel significant or important. When you feel confident and take pride in your work, serotonin is flowing. Similarly, when we feel bigger or stronger than another, we release serotonin. And ultimately, when we receive social recognition from our peers and communities, we release serotonin. Oxytocin is released when we feel trust. It's that good feeling when you are with someone you trust. Social trust feels good because social alliances promote survival. It's similarly released through physical touch of a loved one. As such, oxytocin is often called the love hormone. Endorphins are released when you are feeling physical pain to give you a brief moment of euphoria as a survival mechanism. Real physical distress triggers endorphins. Though laughing and crying also releases small bursts of endorphin. All of us have these four chemicals periodically flowing through our brain in response to our environment. But the reality is each of us develop very different brain chemistry, affecting how these four chemicals manifest in each of us. This is because before we are eight years old and during puberty, a substance called myelin is prevalent throughout our brain. It coats our neurons and facilitates the creation of the neural network throughout our brain. The experiences we have in our youth shape us and quickly create new neural pathways. But when we get older, myelin reduces and it's becomes much harder to modify the brain chemistry to create new pathways. So it's important to remember how each of us is wired is different based on our early life experiences, varying the effect and frequency of release of each of these happy chemicals in our brain. So how can we leverage this framework to build more delightful products? It comes down to thinking through how our product might create an experience that releases one or more of these happy chemicals. Let's take dopamine to start. When we enable our users to feel a sense of accomplishment for completing various tasks or actions within our product, we can trigger dopamine. And when that accomplishment takes the form of a meaningful reward for our user, the effect is increased. When a user purchases a much-wanted product on Amazon, they experience dopamine due to the anticipation of receiving their sought-after good. It's also released when we can check-off that item from our to-do list app. As another example, take serotonin which is released when we feel important. Social networks take advantage of this, since as you get likes or increase your network size, your feeling of importance goes up and results in the release of serotonin. The interplay with dopamine is interesting here, as we learn to anticipate the reward and in anticipation, also release dopamine when we first share something on social networks. Understanding the science of happiness, specifically the four happy chemicals, gives us a framework to think through just how we might start to elicit this emotion and the resulting happy chemicals through the product experiences we design for our users. For those interested, I encourage you to read more from Loretta Graziano Breuning in her book, Habits Of A Happy Brain: Retrain Your Brain to Boost Your Serotonin, Dopamine, Oxytocin, and Endorphin Levels.